What is Japan Bunny Island? 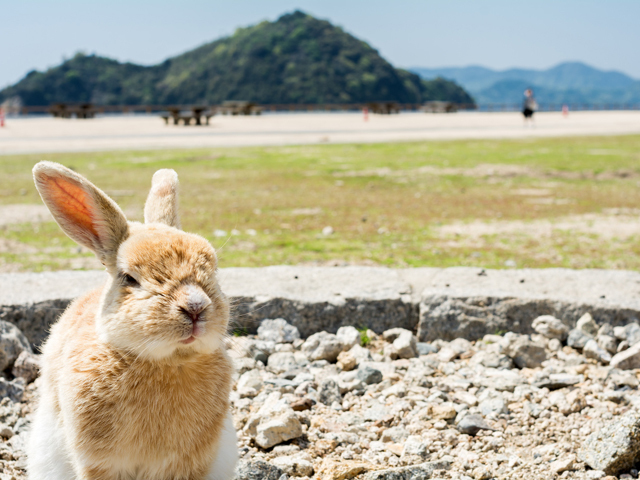 Japan’s bunny island, or ‘rabbit island’ is actually called Okunoshima and is located in the picturesque Seto Inland Sea off the coast of Hiroshima. It is famous for being over run by cute little rabbits. There are thousands of them! How did the bunnies take over? The origins of Japan’s bunny island are really quite sinister. During the second world war, the Japanese were investing resources in producing various chemicals for use as poison gas. 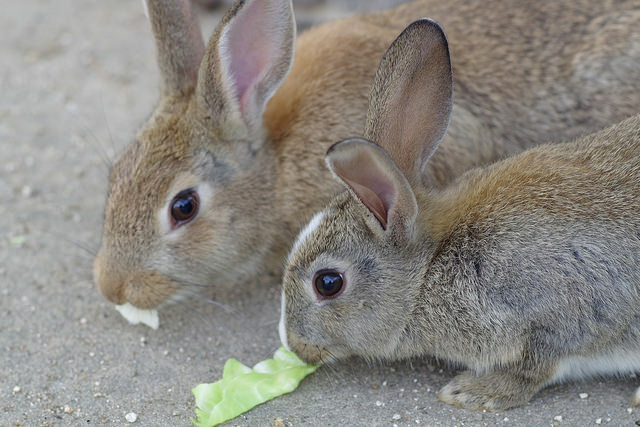 Okunoshima was chosen as the location for the poison gas factory, and the rabbits were introduced for chemical testing. When the war ended, the surviving rabbits were released and they did as bunnies do, reproduced. During the manufacture of five different kinds of chemicals, predominantly for use against China, the bunnies were routinely tested and killed. There were also many accidents and many workers in the factories died, too. These workers sometimes included children. There are various exhibits and accounts of what happened on the island, held at the museum on the island. Much of it has not been translated into English however. The island is blessed with natural beauty, but due to its use for chemical weapons production over a 16 year period, it was kept off the map for that time and has only recently become a destination for day trippers and tourists. These days there is no real industry on Okunoshima. The chemicals are no longer produced and effectively it just remains as a tourist destination of sorts. 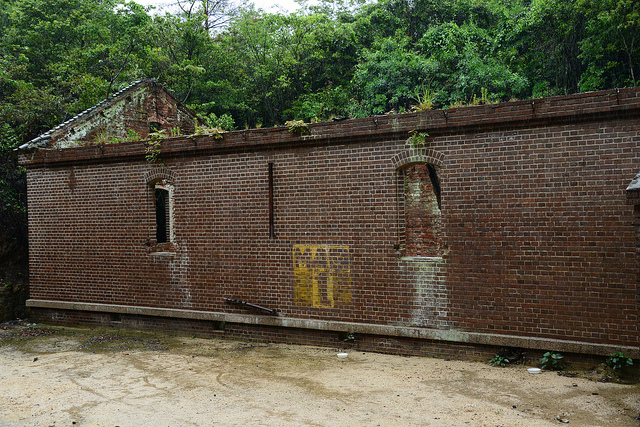 The chemical factory is abandoned and can be viewed quite freely, or alternatively you might take a hot spring bath and relax at the hotel after feeding the rabbits. You’ll find pellet food for sale at 100 yen so that you’ll be able to entice the furry bunnies as close as you’d like, and they’ll happily eat in front of the paparazzi before scurrying away. 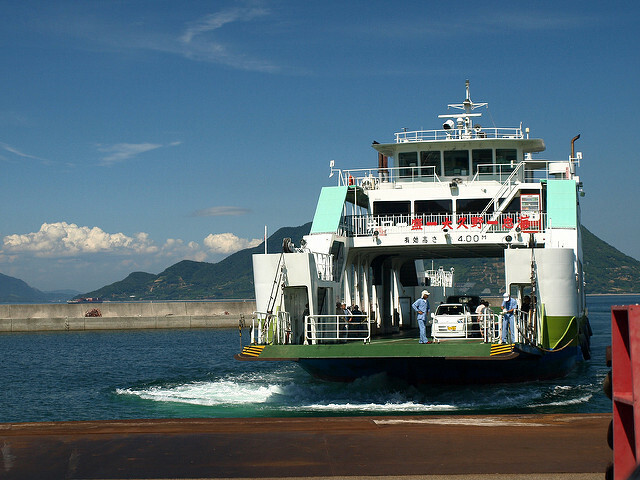 Okunoshima can be reached easily from Tadanoumi port. 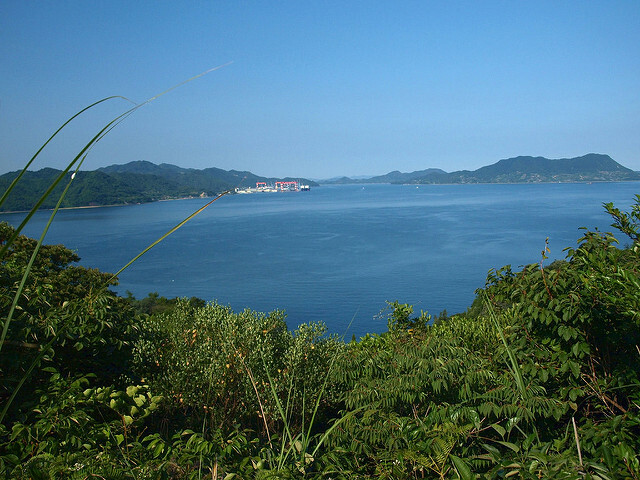 Located south of Hiroshima, the ferry from Tadanoumi makes it only a 15 minute trip to reach the island. Between 7:45 in the morning and 7:30 in the evening, there is a regular ferry service in operation, with departures every 30 minutes or so. One way tickets cost 300 yen for adults or 150 yen for children. 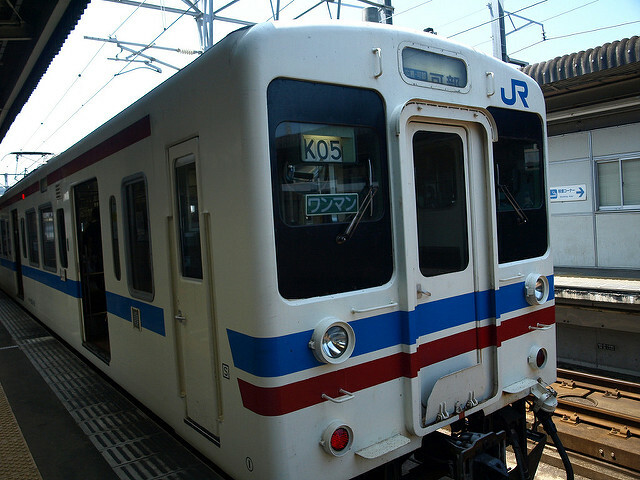 Tadanoumi station lies on the Kure line and is a 2 hour train ride on a local train from Hiroshima. 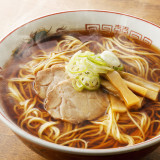 It costs approximately 1,500 yen one way. 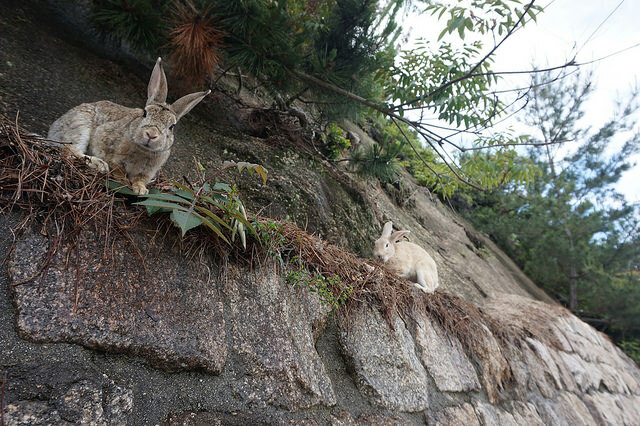 Depending on your position on Okunoshima, you will have great views of the Seto Inland sea as well as bunnies. To the north you can look back towards the mainland, with Hiroshima in sight. 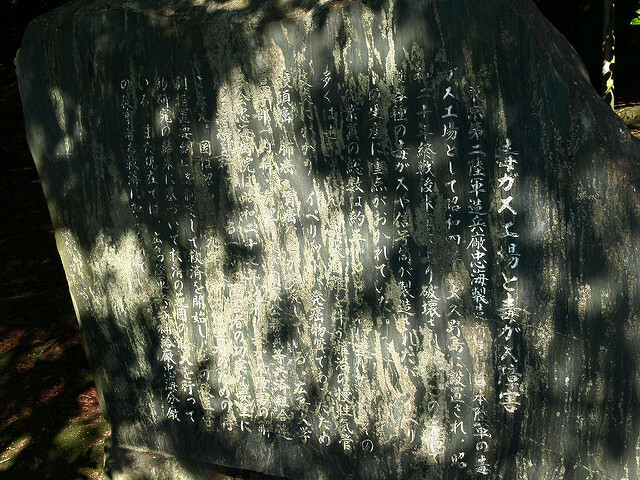 Omishima Island lies to the south and Ikuchi Island lies to the east. 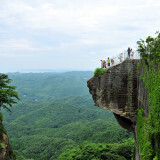 South west is Osaki Kamijima. 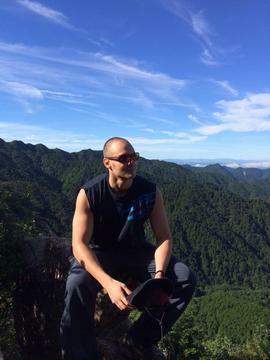 The Seto Inland Sea is beautiful and on a sunny day the views are really breathtaking. There have been concerns raised about the safety of the Okunoshima island. Given that there were at least five different chemicals produced here for poison gas, and the fact that thousands of bunnies, many workers and some children were killed in manufacture, the chemicals were clearly of significant harm to living creatures. However, there has never been a proper program of decontamination on Okunoshima island. 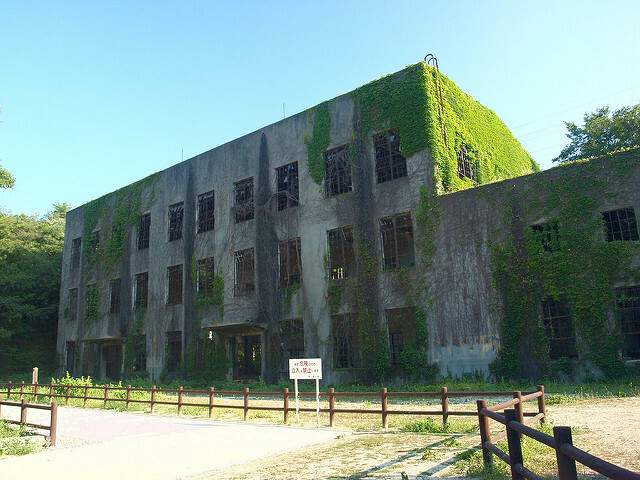 There are rumoured to be sealed chemical dumps remaining on the island, and while many Japanese official walkways may seem somewhat redundant, it would be advisable to stick entirely to the official paths when walking around on this poison gas island. 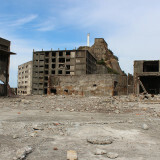 There are walking tours available for those who would like to enjoy a tour of the island, plenty of bunnies and above all the peace of mind given from knowing that your guide knows the area well and will not accidentally end up in a chemical hotspot. 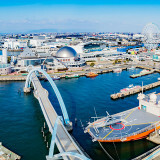 After you’ve enjoyed bunny island, why not continue on the ferry over to Omishima rather than head straight back to the mainland? 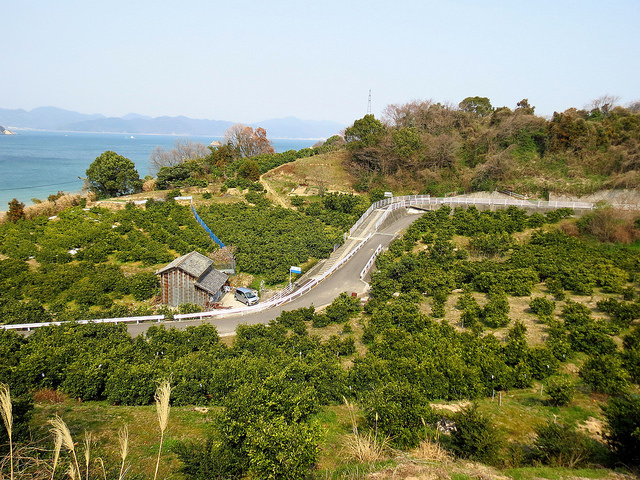 Omishima is a much larger island with a variety of sightseeing options and one of the islands connected by the incredible Shimanami Kaido. Plenty more splendid views to be had when the weather is good.